The Kemp’s Ridley sea turtle, Lepidochelys kempi, is one of the most endangered sea turtles. It is also one of the smallest. The adults generally weigh 100 pounds or less, with a straight carapace length of approximately 2 feet. Adults are gray-olive above (carapace) and cream or yellow below (plastron). Hatchlings are gray-black above and below. They are named after a Key West resident, Richard Kemp, who sent two Ridley specimens to Harvard for identification about 90 years ago. Kemp’s Ridley sea turtles are found in the Gulf of Mexico and along the eastern coast of the United States as far north as Nova Scotia, and eastward to Bermuda, the Azores and Europe. The adults diet consists of crabs, jellyfish, fish and mollusks. The juveniles diet consists mostly of seaweed. The Kemp’s Ridley, as with all sea turtles, lives exclusively in the ocean. The only time they are not in the ocean is when they lay their eggs on the beach, and when as hatchlings they emerge from the nest. Sexual maturity is reached at ten to twelve years of age. Nesting occurs, during the day, from April to August. When digging the nest the female uses her front flippers to dig a ‘body pit’ which she gets into and then with her hind flippers scoops out a cavity for the hundred or so eggs she will deposit. Many eggs are lost to natural causes, such as prolonged flooding of the nest, beach erosion, & predators. The surviving eggs hatch in approximately two months. Emerging hatchlings are inundated by predators on their journey to the water and many do not survive. Almost all Kemp’s Ridleys nest on a 20 mile stretch of beach at Rancho Neuvo in Tamaulipas, Mexico (about 200 miles south of Brownsville, Texas). A film taken there in 1947 shows an estimated 40,000 female turtles on the beach. These mass nestings are known as “arribadas” and are believed to be a reproductive strategy. Today the number of female turtles in an arribada rarely exceeds 200, and many females nest singly. 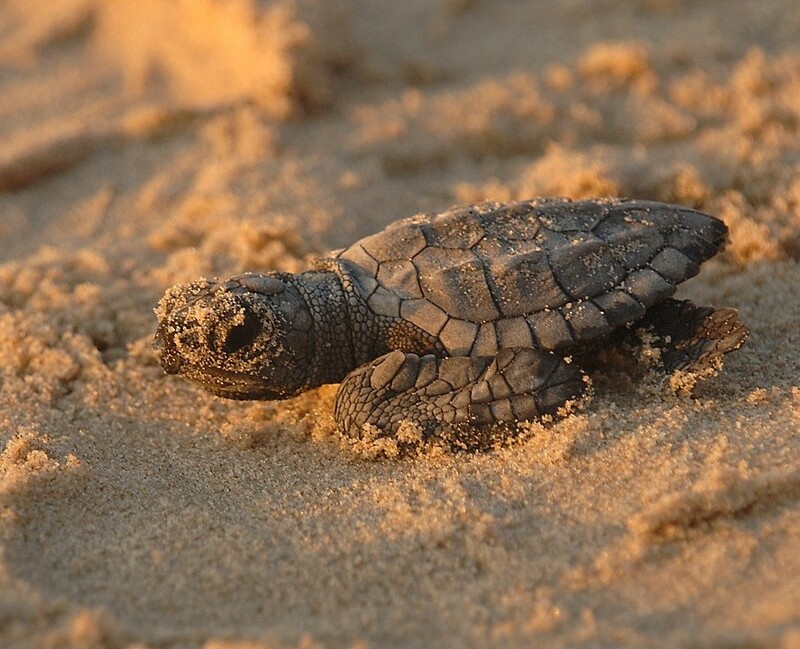 In 1977 Rancho Neuvo was declared a Natural Reserve and programs were implemented to protect the nesting beach in order to reduce the poaching of adults and eggs for human consumption and reduce losses to predators. The efforts have been successful, but the population is still declining because of other threats. 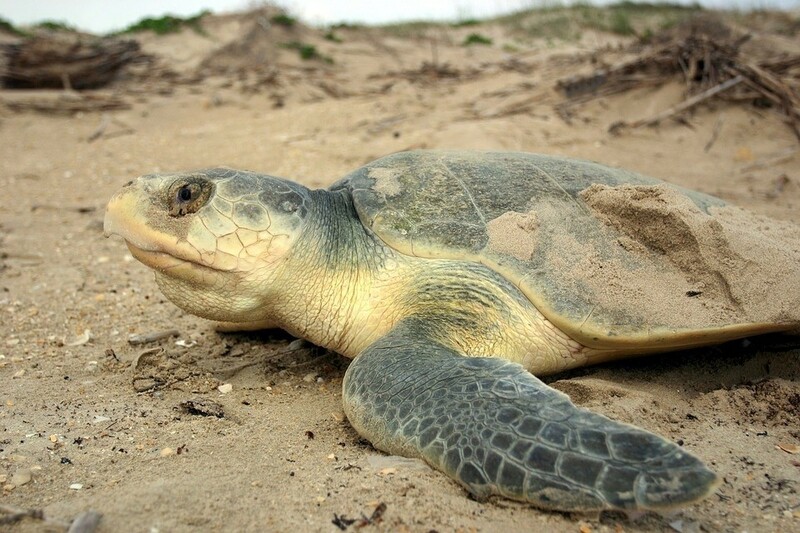 Until recently it was unheard of for a Kemp’s Ridley to nest anywhere except in Rancho Nuevo, but in 1989 a successful nesting did occur on Madeira Beach in Pinellas County, and four non-nesting excursions occurred in Palm Beach County. In 1994 a nesting occurred in Clearwater Beach, and in 1996 a nesting occurred on Sanibel Island and in Volusia County. The occurrence of Florida nesting may be attributed to a “head-start” program initiated in the late ’70’s. The head-start program seeks to reduce the high mortality rate of hatchling turtles by raising them in captivity until they have outgrown many of their predators, then releasing them into their natural environment. The greatest threat to the Kemp’s Ridley sea turtle today is drowning in shrimp trawls. One of the most recent conservation efforts is the requirement that owners of shrimp boats install TED’s, or Turtle Exclusion Devices. The TED is fitted into the neck of the shrimp trawl to prevent large animals from going into the net and drowning. TED’s are effective at excluding up to 97% of sea turtles with a minimal loss of shrimp.It is believed that the breeding population of Kemp’s Ridleys is down to about 350 mature females, so a single turtle that dies in a shrimp trawl is a significant loss. Other human threats include commercial exploitation for luxury products, disturbance of nesting beaches & feeding areas, pollution, and non-degradable debris in the ocean.